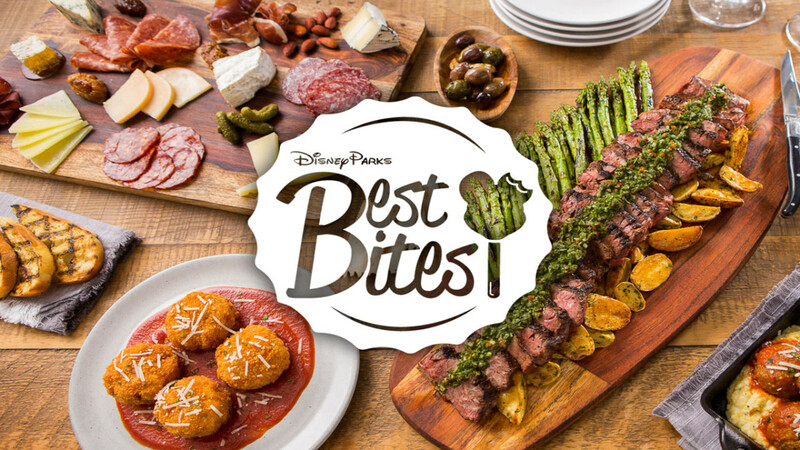 For this month’s Best Bites we have some new offerings at Magic Kingdom Park, Disney’s Animal Kingdom, Disney’s Hollywood Studios and more! But first, I’ve got some exciting news straight from Disney Springs! If you haven’t already heard, Wine Bar George will be joining the array of amazing new food and beverage locations that are being added across Disney Springs and will be opening its doors this spring. A new venture created by Master Sommelier George Miliotes, Wine Bar George will be the only Master Sommelier-led wine bar in the state of Florida. It will offer a unique experience that includes wine education, special visits from renowned winemakers and a wonderful menu with a selection of small and shareable plates, cheese and charcuterie boards and desserts. In addition, the location has now named its new Executive Chef – Ron Rupert! Rupert has been with the Walt Disney World Resort since 1988 and has been part of the opening teams for popular locations like Jiko – The Cooking Place at Disney’s Animal Kingdom Lodge and California Grill at Disney’s Contemporary Resort, where he teamed with Miliotes and Chef Clifford Pleau. Rupert and Miliotes have worked closely together to create a menu that will pair with a wine list of over 100 selections. The wine bar will be located in The Landing directly across from The BOATHOUSE® and is set to open its doors this spring. In other news this month, Mini Babybel® Cheese is now being offered at a variety of food and beverage and merchandise locations across the Walt Disney World Resort. As the official snack cheese of Walt Disney World Resort, you can find them in single or triple packs with the mild, creamy and delicious Original Mini Babybel® flavor. A good source of calcium and protein and 100% real cheese, this is a snack the whole family will love! In addition, Mini Babybel® will be featured at Woody’s Lunch Box – the new walk-up quick service window that will be part of the new Toy Story Land in Disney’s Hollywood Studios. Also at Disney’s Hollywood Studios, ABC Commissary is welcoming new dinner platters and a new drink to their menu! The new platters are each served with steak fries and coleslaw and include a Shrimp Platter, a Fish and Shrimp Platter, and a Fish, Shrimp and Chicken Platter. The new drink is the Happy Daze – with Parrot Bay Coconut Rum, melon liqueur, banana liqueur, grenadine and orange and pineapple juice. At Disney’s Animal Kingdom, Restaurantasaurus has added a couple new items to their menu. You can now order Battered Fish served with French fries for lunch or dinner, and new on the drink menu is the Prehistoric Margarita with Jose Cuervo Tequila, Triple Sec and lime juice. Over at Magic Kingdom Park, Casey’s Corner is featuring the All-Beef Buffalo Chicken Hot Diggity Dog as February’s Hot Dog of the Month. This all-beef hot dog comes topped with chicken tossed in buffalo sauce, celery and a garlic ranch drizzle. And once you’re done chowing down at Casey’s Corner, head on over to Plaza Ice Cream Parlor where you can cool down with this month’s featured flavor of ice cream – peanut butter! And if you’re dining at The Plaza Restaurant, you’ll want to try the new Warm Butterscotch Bread Pudding with caramel drizzle for dessert, which has my mouth watering just writing about it! In Frontierland, you can now find Happy Trails Mix at Westward Ho, with house-made marshmallows, pretzels, chocolate gems and mixed nuts. And the Golden Oak Outpost is serving up a couple new savory snacks as well, including BBQ Chicharrónes – pork cracklings with a BBQ seasoning – and Chili Cheese Waffle Fries with chili and white queso cheese sauce. Now open year-round, Tortuga Tavern has added a Short Rib Sandwich consisting of Chipotle BBQ short rib and citrus slaw served with a side of chips. This is also a good place to get Turkey Legs or an All-Beef Hot Dog. And last on the list, Pinocchio Village Haus in Fantasyland is now offering a Hawaiian Flatbread as February’s Flatbread of the Month! This pizza comes topped with pineapple, ham, cheese and red sauce and will be available through the end of the month. And just across the way at Friar’s Nook, you’ll now find yummy Fried Twinkies, served with your choice of strawberry, chocolate, vanilla or caramel sauce.